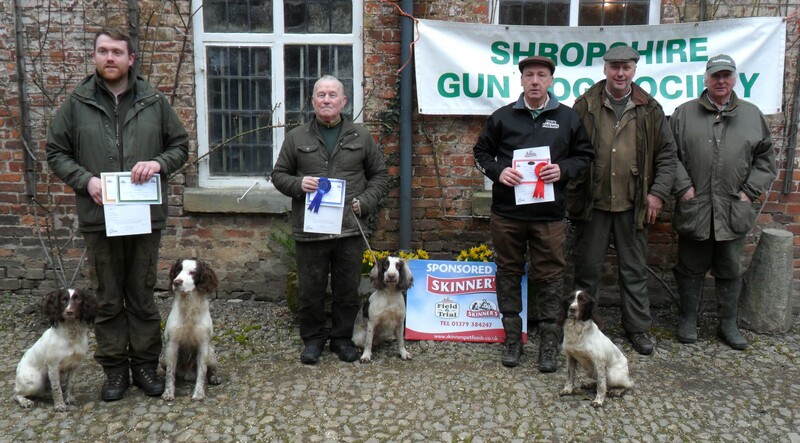 Shropshire Gundog Society held an AV Spaniel Spring Working Test, at Halston Hall, Whittington, by kind permission of Mr Rupert & Mrs Harriet Harvey under the stewardship of the test secretary Jane Holmes. Both tests were well supported and held in the Big Wood which has good ground cover of brambles and fallen trees, perfect for Spaniels. The weather was good this year, cool enough for the dogs, dry and minimal wind. Thank you to our judges Mr Ralph Edwards, and Mr Richard P Jones, who were very sympathetic and helpful in their comments to all competitors, particularly the novice handlers and dogs. 1. Natcarw Woodcock (ESS B) Mr Roger Wooldridge. 2. Boothsbrow Messin Around (ESS B) Ken Hilley. 4. Edwardiana Handy (ESS B) Paul Flaherty. Best Puppy in Novice, Rootytwo Pebbles (ESS B) Alan Wilson. 1. Gola Storm Star (ESS B) Mr Roger Wooldridge. 3. Edwardiana Breeze (ESS B) Mr David Williams. 4. Edwardiana Howdee (ESS D) Mr David Williams. Grace Brown, Chris Brown, Dave Bishop, Ken Jones, Adrian Joynt, Gill Awty and Malcolm Awty. Once again a big thank you to our sponsors Skinners, especially Elizabeth Wooltorton, who provide the Certificates and dog food vouchers in both tests. A raffle was also held on the day raising a fantastic £62.50 for our charity “Grinshill Animal Rescue”.